Brands see it as a potential boost for revenue earned through their apps and a boon for customer engagement. MOUNTAIN VIEW, CA: Google has tweaked its Google Now personal assistant service to include information from brand partners ranging from TripAdvisor to Airbnb. Google has signed partnerships with 40 companies, meaning that new, branded cards will pop up on Google New alongside the usual alerts about weather, traffic, and meetings. Google Now is comparable to Apple’s Siri, providing contextual information based on a user’s location or schedule. The update is significant in that it allows Google to use customers’ information from brand apps for the first time. Up until now, Google Now has only used information from Google’s own services, employing Calendar for meeting alerts or Maps for travel planning, for instance. It also has obvious implications for brands, such as making them more revenue through their apps and boosting consumer engagement. For example, a Google Now user who has also downloaded the dedicated eBay app will see personalized alerts pop up notifying him that an auction is about to end. That could potentially prompt the user to complete a purchase through the app. Hailo's UK marketing boss, Danielle Morgan, said the partnership was a "no brainer." "Let’s say you come into London and you book a Hailo cab, and you go into a particular area between 7 am and 10 am," she told Marketing. "If you’re still there at 5 pm, there’s an assumption you may want to leave, and that’s when the Google Now card would prompt you to book a cab." 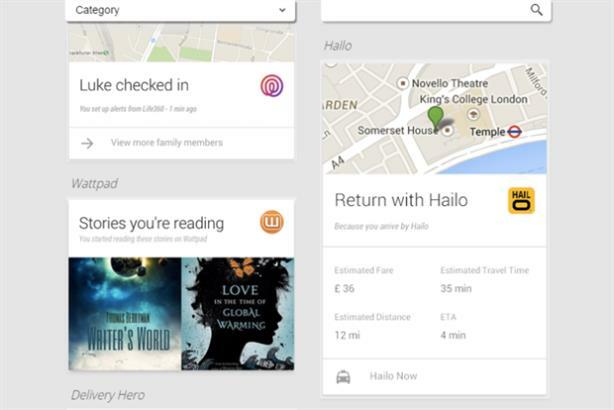 For Hailo, the partnership means marrying its own customer data to Google’s in an intelligent way and boosting its chances of a booking, either through the Google Now card or the Hailo app. Morgan told Marketing that the partnership was "mutually beneficial" and there were no financial terms, beyond development resource. That may change in the future, however, if Google Now boosts sales or bookings for its partners. "From our perspective, we’re focused on taking the stress out of travel for customers in the city," Morgan said. "This is part of our commitment to making life easier." Morgan added that Hailo would look to develop its Google Now functionality further, depending on customer interest. Marketing understands that Google will expand beyond its 40 launch partners, fine tuning the technology to gauge quality and consumer demand. The first 40 brands were intended to represent diverse use cases, since they include everything from dating apps to travel. The updated version of Google Now is only available on the Google app for Android. Users who want to see branded cards will also need the brand's app.